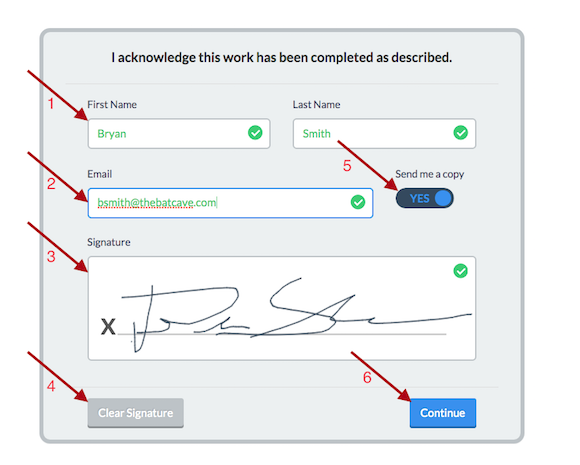 Learn how to get customer signatures in the field. This article will run through the steps of creating a Work Acknowledgement by a tech in the field, and requires a tablet to complete. The work acknowledgment step will typically be the second to last step during a job. Once the technician completes the work for the customer, prior to clocking out, they have the option of having the customer sign for the work and create a Work Acknowledgement. This can then be emailed to the customer in PDF form and can also be accessible to them online. The work acknowledgment portion of the job steps can be achieved on an Apple or Android tablet. There are three different ways to reach this browser view. First, On a tablet go directly to the url: https://app.servicetrade.com/tablet#/. Second, If using the ServiceTrade Mobile App on a tablet, click on the "View more details" (pictured below) on the bottom of a job details page. Third, You can access the browser mode from a computer by scrolling to the bottom of most pages in ServiceTrade and clicking "Switch to Tablet Mode." The following steps will take you through the Work Acknowledgment process from start to finish. 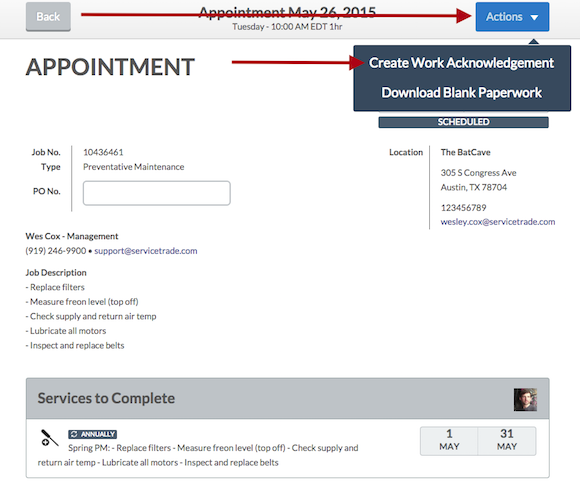 Although not required, this tutorial will include the option of creating an invoice within the Work Acknowledgement. 1. After logging in to the tablet mode in a browser, you'll see a list of your assigned jobs for that day. 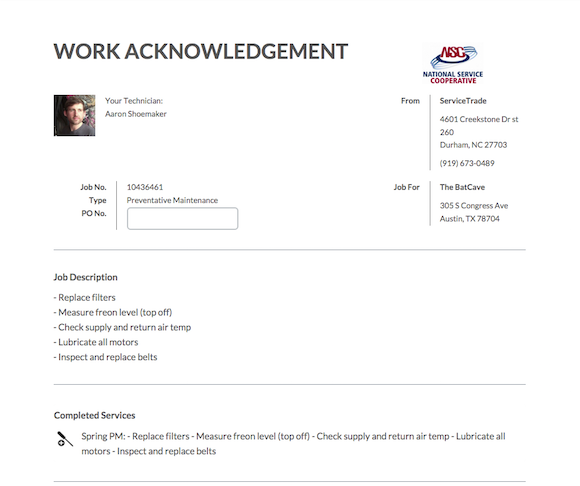 To start the process of creating a work acknowledgement for a particular job, click/touch the arrow on the right side of the job you are currently on. 1. Job Number, Job Type and a Fillable field for PO Number. 2. Primary contact information for that location. 3. Job Description (if applicable). 4. Job Services including service description, due window and assigned tech. 5. Date, Time and Duration details. 3. Click the Actions button in the top right. Then choose Create Work Acknowledgement. 4. This will bring you to a similar looking page where you can start to build your Work Acknowledgment. 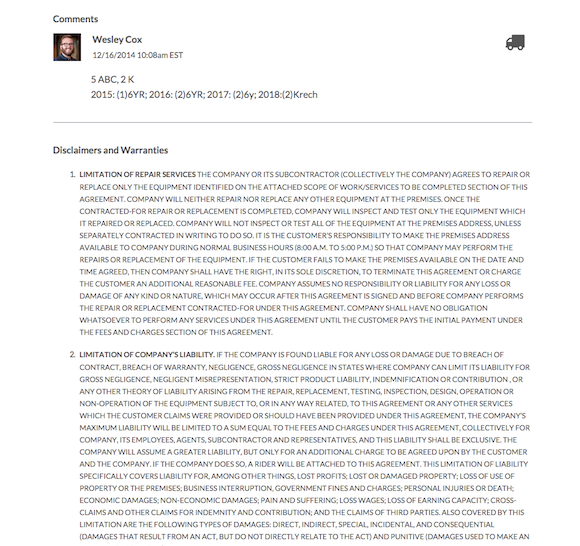 As you scroll down, you'll be able to edit what will ultimately end up on the final customer-facing document. As you edit sections, the page will autosave. 5. There will be a series of visibility switches for each section or object. When flipped to Yes, the customer will have visibility on the Work Acknowledgement. When flipped to No, the corresponding section or object will be omitted from the final document. 6. The first example will be the Job Description or Job Services. If the customer should not see this information, change the switch to No and the customer will not have access. 7. The first editing option is located below the Job Services. 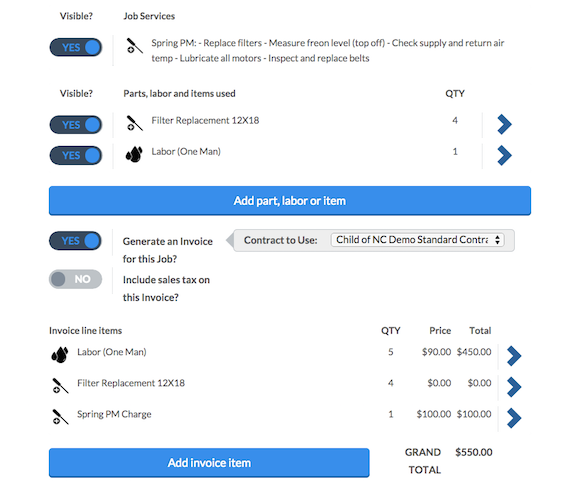 There will be a blue button bar labeled "Add part, labor, or item". Click/Touch this button. 1. The visibility switch for that item. 3. The Parts, labor or items used field. 4. The Service Line of the item. 5. The Save button for the item entered. 9. 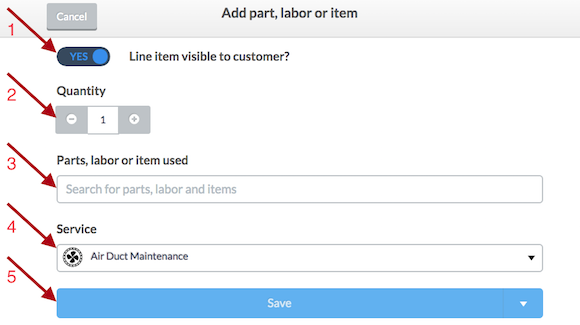 Use the Parts, labor or items used field to manually add items or search your company's item list. As you type, you'll see matching items appear below the field. These items are selectable. 10. If you have multiple items to add, you can click/touch on the triangle to the right of the Save button. This will allow you to save the current item and clear the field in order to add more items. 11. Once your item(s) are added with Visibility, Quantity and Service line, click/touch the Save button. This will bring you back to the Work Ack build screen. 12. You should now see the list of items added with their quantity. You can edit these items by clicking the arrow for each item on the right. You also have visibility controls on this list view. 13. The next section is the Invoicing option. If you are not invoicing in the field, you'll either not see this option or you should keep this set to No and skip to the next step. 1. Yes/No switch for generating an invoice. 2. Yes/No switch for adding sales tax. If flipped to Yes, you'll have the option to use the local sales tax or manually change the sales tax. 3. Items added above will be added as Invoice line items. 4. A button to add more items if needed. 5. 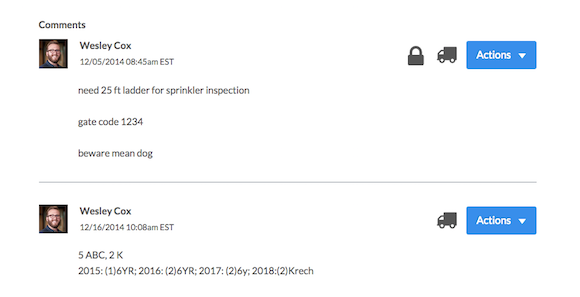 A Contract dropdown. If applicable, a different contract can be chosen in the field. 6. Quantity, Prices and Totals for the Invoice line items. 7. Grand Total of the invoice. 14. If the added items have pricing in your company's system, it will automatically load in the Price and Total area. If there are no prices in the system or if you manually added an item, you can edit the price of the item by clicking/touching the blue arrow to the right of the item. 15. This will bring you to the Invoice edit item page. This is similar to the Item add screen from step 8 with the only different being the Unit price can be updated. Click/Touch save when you've completed your edits. 15. 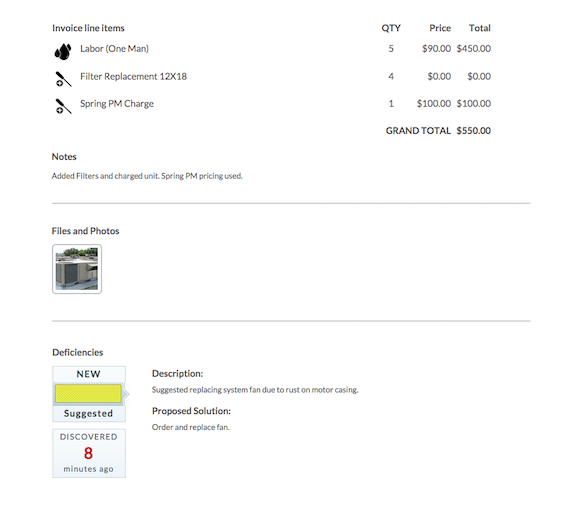 When back on the main page you can also click the Add invoice item button to add more items to the invoice. 16. 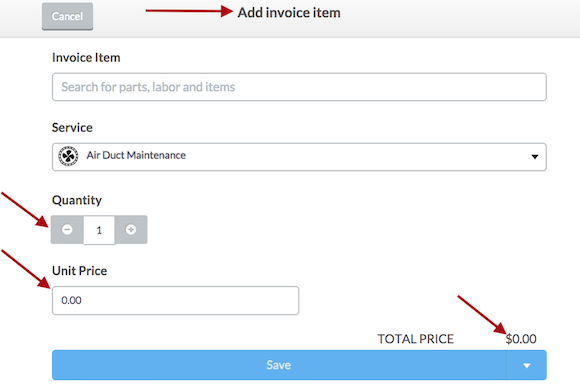 One last change you can make to the invoice is in the notes field. 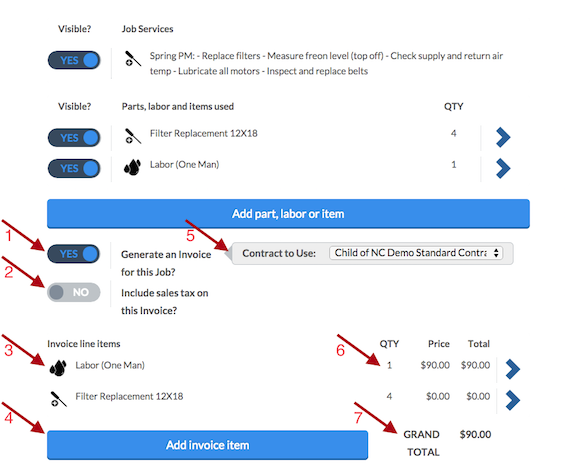 If there is a need to add notes or comments to the invoice directly, you can add this below the Add Invoice item button. 17. Once you have your items and prices finalized, you're ready to move on to the next step. 18. Below the items section, you'll find the Photos and Files area. If there were any pictures taken with the Mobile App throughout the job, they will show up here. Each will have a Visibility slider to hide or show them to the customer. 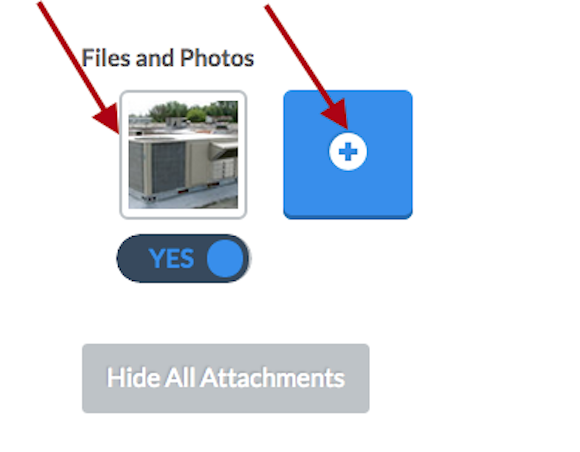 You can also add photos directly to the Work Acknowledgement here by click/touching on the blue plus button. 19. The next section is for Deficiencies. - Any deficiency found on the job will have it's details shown here and the visibility turned to Yes. You can add pictures if needed or change the visibility. 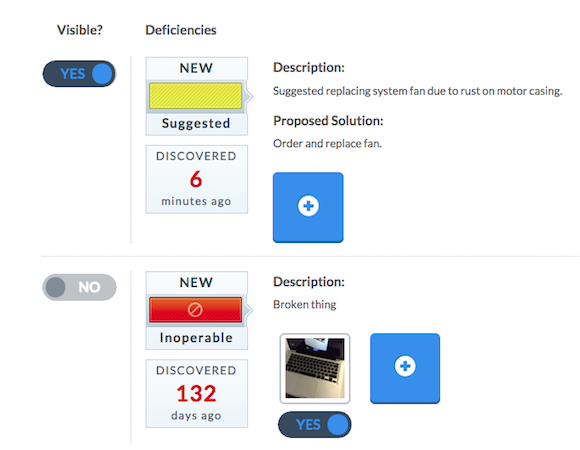 - Any deficiency found on previous jobs for that customer will also show but will default to No visibility. You can add pictures if needed or change the visibility. - There is also an option to add a deficiency if needed. 20. 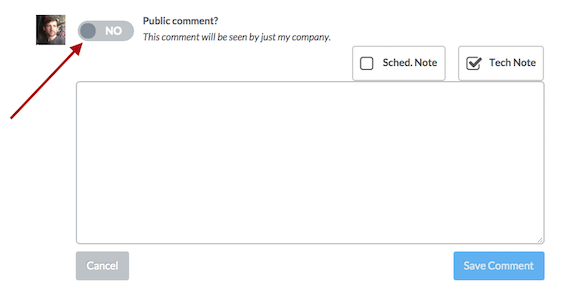 The next section will show your comments on the job. The lock symbol on the comment section means that the customer will not see the comment. If its lacking a lock, this means the customer will see this comment. You can edit the visibility or edit the comment content by clicking the actions button and choosing edit. 21. You can also create a comment by clicking Add Comment. This will bring you to the comment edit screen. You can add content and change the visibility. 22. Once you have all of these sections finalized. You're ready to completed the Work Acknowledgment and show it to the customer. Scroll back up to the top of the page and click the blue Review button. 23. Clicking the Review button will give you the final view of the Work Acknowledgment. 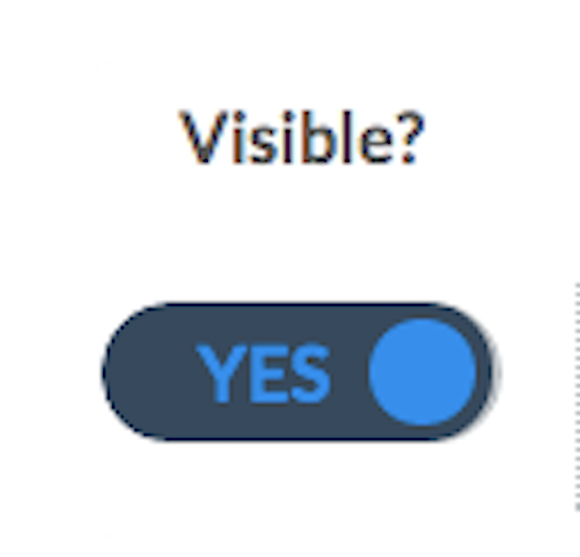 It will eliminate all the sections and content with a visibility set to No and show all set to Yes. You can then show this to the customer and review the work done and elements of the job. 24. Once the customer confirms and agrees that the work is complete. They can check the acknowledge box at the bottom of the page and Click/touch the Confirm and Sign button. 25. This will bring you to the final step in the Work Acknowledgement. The customer signature. 1. Add the customer's first and last name. 2. 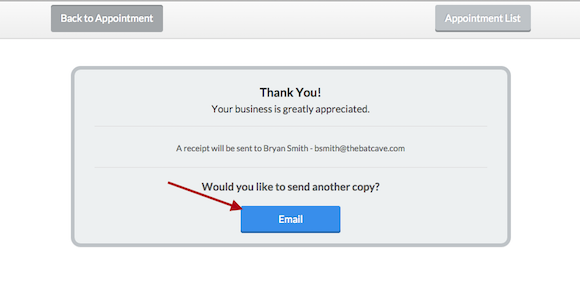 Add customer's email (optional if "Send me a copy" is set to No). 3. Have the customer sign with their finger or use a stylus to sign. 4. You have the option to clear the signature if needed. 5. If the customer does not need an email copy, you can flip Send me a copy to No. 6. Once all the above is filled out, Hit the continue button. 26. This will bring you to the Confirmation screen. If needed, from this screen you can send the invoice to another email. By clicking/touching the email button. 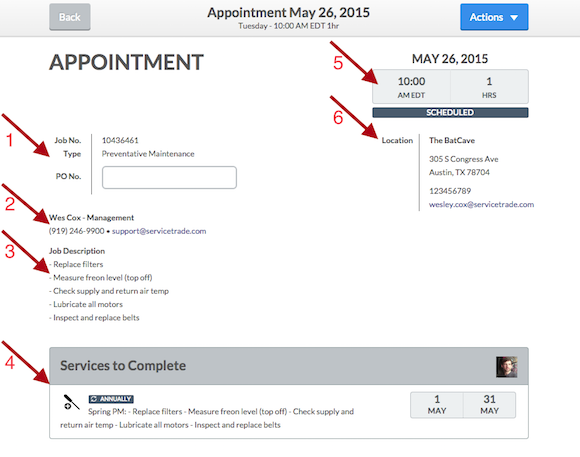 From there you also have the option to go back to your appointment list or back to view the appointment details. 27. The last step is to go back to the mobile app on the tablet or phone and clock out of the job. 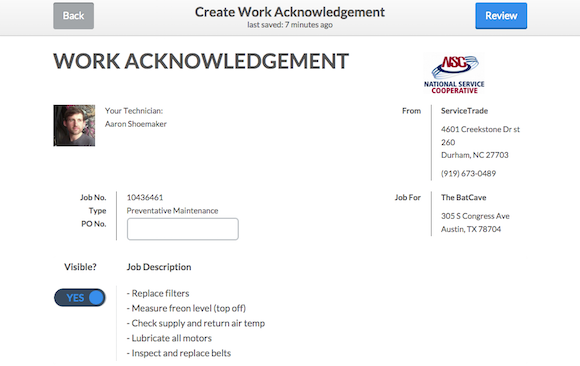 Once completed, the Work Acknowledgment will instantly be viewable on the job page in the office. This completes the steps for creating a Work Acknowledgment in the field with a tablet. Can I modify a work acknowledgement that has already been sent, and then resend it? You can't modify a work acknowledgment after its been created. The PDF has been flattened and prohibits editing. However, a User with Admin credentials can delete the Work Acknowledgement from a Job, which will allow the Tech to create another one. The one caveat to this is the Work Acknowledgment is NOT IMMEDIATELY available for the Techs to create after it is deleted by an Admin. *IT WILL TAKE TIME* before the the Tech can create a new one.